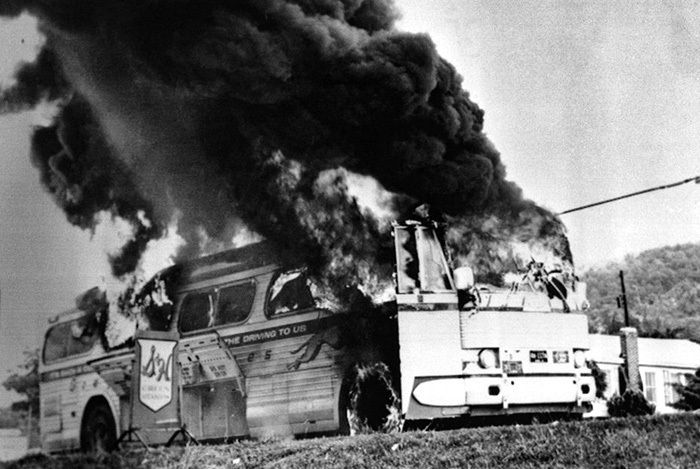 The burning Greyhound bus pictured here carried Freedom Riders into Anniston on May 14, 1961, as part of an effort to test a newly enacted integration law regarding bus stations in the South. After the riders were attacked at the station in Anniston, the bus was firebombed after breaking down several miles outside the city. Many of the riders were beaten, with several being severely injured, by a white mob as they departed the bus.